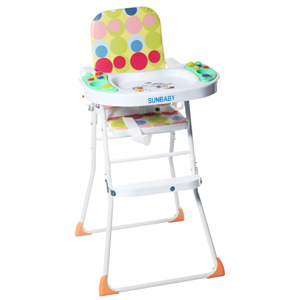 New Sunbaby lightweight, compact and intuitive musical highchair. It is easy open or fold, using the intuitive controls, and folds down very small in a simple, but safe way. When folded the chair is freestanding and takes up a minimum of space. A comfy padded seat cushion which is washable. To Recieve updates and possible rewards for Sunbaby SB-26M Polka please sign in. To Recieve updates and possible rewards for High Chairs please sign in.